Powerful, affecting essays on mental illness, winner of the Graywolf Press Nonfiction Prize and a Whiting AwardAn intimate, moving book written with the immediacy and directness of one who still struggles with the effects of mental and chronic illness, The Collected Schizophrenias cuts right to the core. Schizophrenia is not a single unifying diagnosis, and Esm Weijun Wang writes not just to her fellow members of the "collected schizophrenias" but to those who wish to understand it as well. Opening with the journey toward her diagnosis of schizoaffective disorder, Wang discusses the medical community's own disagreement about labels and procedures for diagnosing those with mental illness, and then follows an arc that examines the manifestations of schizophrenia in her life. In essays that range from using fashion to present as high-functioning to the depths of a rare form of psychosis, and from the failures of the higher education system and the dangers of institutionalization to the complexity of compounding factors such as PTSD and Lyme disease, Wang's analytical eye, honed as a former lab researcher at Stanford, allows her to balance research with personal narrative. An essay collection of undeniable power, The Collected Schizophrenias dispels misconceptions and provides insight into a condition long misunderstood. Winner of the Graywolf Press Nonfiction Prize, The Collected Schizophrenias collects 13 absorbing essays addressing Wang's negotiations with schizoaffective disorder. Though its volume is relatively slim at just over 200 pages, The Collected Schizophrenia is, in its achievements, a big book.... One by one, these essays are tidily structured; and together they form a loose web, circling each other while flung to distant points. This construction supports a vibrant porosity, and Wang adopts a mode of inquiry and unknowing as she explores, with frank coolness, topics ranging from her schizoaffective diagnosis to the compounding effects of PTSD and chronic Lyme disease; from the failures of higher education to the question of parenting. [Wang's] elegant essays are strongest at their most personal...but they also confront major questions about psychiatric care with meticulous even-handedness. Wang, who once hallucinated that she was trapped in perdition, is an implicitly trustworthy guide to this netherworld of psychosis and chronic illness.... Wang's forays beyond the personal occasionally left me unsatisfied.... Still, her characteristic nuance more often carries the ring of wisdom, hard won. In Wang's kaleidoscopic essays, memoir has been shattered into sliding and overlapping pieces so that the story of her life subtly shifts from essay to essay. The images and insights Wang summons from these shards are sometimes frustrating, but often dazzling, and worth the reconstructive work, especially in the places where Wang is able to illuminate the lived experience of psychosis, transforming schizophrenia from its popular depiction as a soul-erasing demonic possession to simply another form of human consciousness.... Wang's essay on her and her husband's decision not to have children (The Choice of Children) is the saddest and most successful in the book.... While the reader may not become more trusting of Wang's perspective after reading these essays, she will certainly become more likely to challenge her own. 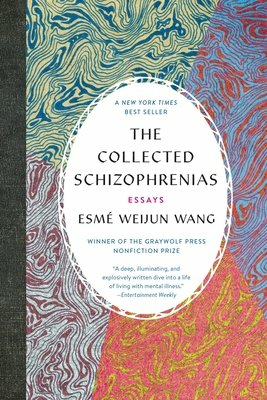 The Collected Schizophrenias compiles 13 important essays about various aspects of schizophrenias, including schizoaffective disorder.... Wang is at her best when she weaves personal experiences with cultural criticism and journalism.... The Collected Schizophrenias fills a vital need in our society, clearing a path into genuinely new literary terrain with uncommon grace. ...[an] unnervingly excellent essay collection... As a whole, The Collected Schizophrenias provides a new and welcome map for the severe landscapes of schizoaffective disorder, of cerebral disease, diagnosis, recovery, and relapse, of the many human mysteries of the schizophrenias. The essays are resoundingly intelligent, often unexpectedly funny, questioning, fearless and peerless, as Wang makes for brilliant company on 13 difficult walks through largely uncharted territory.